Do you have any second parts in your life? 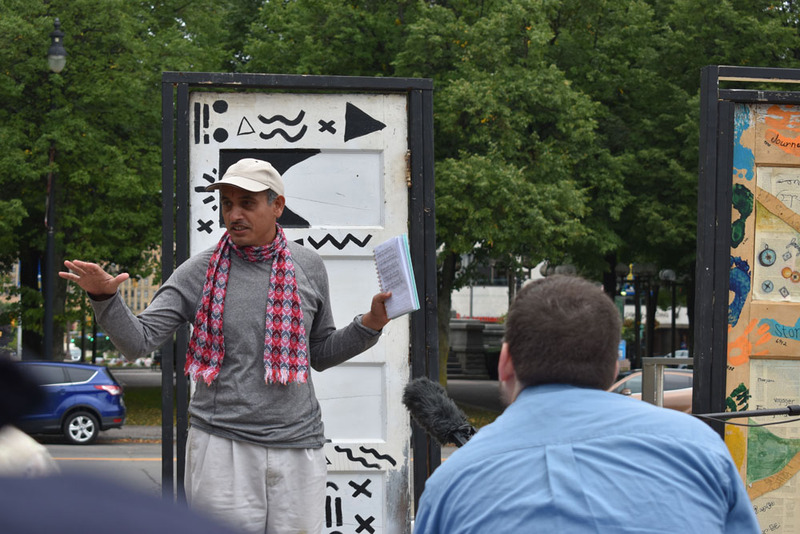 Just Buffalo Literary Center’s Points of Departure (see WBFO’s coverage here) opened with the above question posed by Bishnu Adhikari. It was question that did not require a response but demanded some thought, much like everything else that morning. 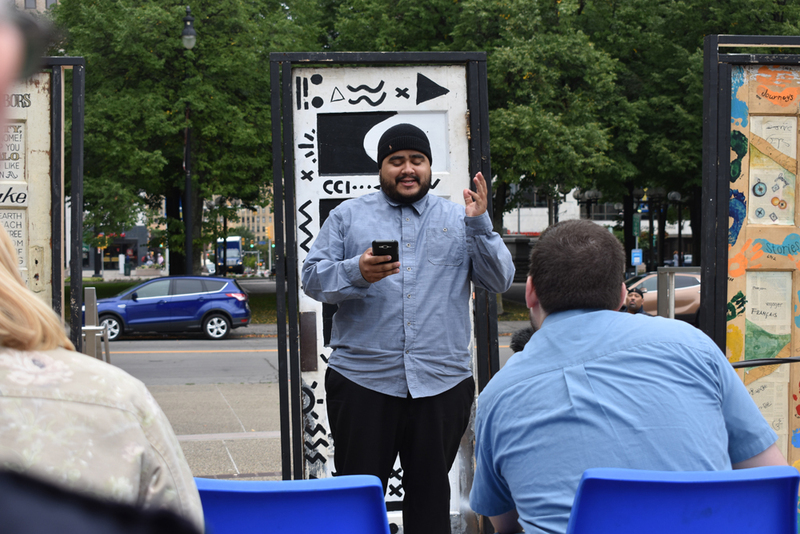 In collaboration with Journey’s End Refugee Services and Just Buffalo’s Words on the Street initiative, immigrants and refugees took the stage to share poems about their experiences in making America and Buffalo a new home. Another door, created by artist Paris Henderson, featured abstract black and white patterns. The last door was plastered with the word “journey” in various languages, the native tongues of those who were encouraged to go up and write it. Soon enough it became clear how much of everything felt like an invitation, or, more pointedly, an open door. Bishnu, a Buffalo resident since 2009, pulled everyone out of the trance of anticipation waiting for something, anything, to let us know things have begun. It was the first brisk morning in months, and attendees were in a type of shock from the cold that doesn’t escape you until something more stimulating takes hold. Bishnu’s opening helped bridge a connection of our relationship with time and place. Initially from Bhutan, Bishnu arrived at many second comings in his own life. They cam in the form of studies that led him to India; an eviction that led him to Nepal; and then as a Buffalonian and translator for Journey’s End. It was the wind, he said, that carried him from place to place. So he spoke to it. Forcing me to leave everything that I loved. Dragging me away from the position. I was so worried and sad. Please fly there and share my story. Despite the many roles and various homes Bishnu had, he always considered himself to be a writer and lyricist. The Notes app on his phone wis filled with Nepali writing, which he later translates for an English-speaking audience. One thing you notice about Bishnu is his attention to his surroundings. He mentioned Buffalo’s beauty to me twice in our conversation. But he made sure to specify: “Buffalo is beautiful, to me.” It is as if he’s acknowledging that perhaps it isn’t always that way, or for everyone, but in this moment, he wants to reassure me, for him, that the life he has made here is beautiful. In a very subtle manner, Bishnu demands more conscientious thought from his listeners. The presenters chose different approaches to express their experiences. One man sang a song in Nepali that sent chills down my spine. 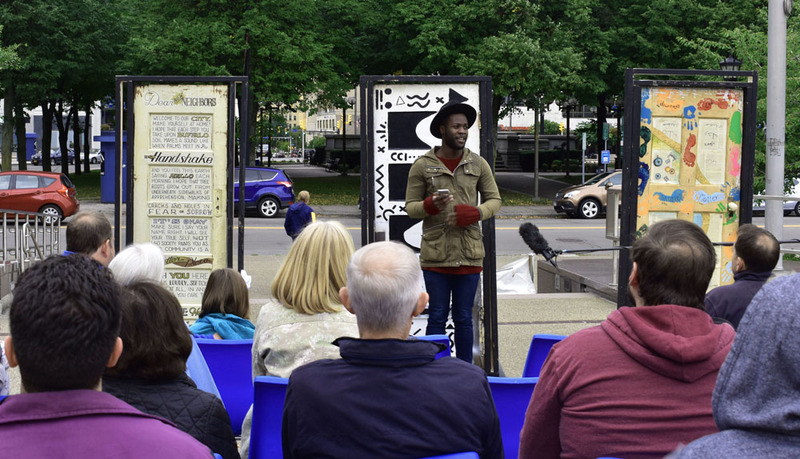 Another admitted he came ill-prepared, and instead of a poem shared a story about his son, who had just started school in America for the first time. The youngest presenter spoke so softly, she was likely the only one who heard her poem, and maybe the only one who needed to. Only one poem managed to get a real chuckle from me and almost the entire audience. It grappled with the political and philosophical analysis of the “word” Covfefe. Julio Valentin thought it meant coverage, though he presented various renditions. I gotta go to bed now. The “word” managed to catch the audience off guard, hence the wave of laughter that emerged as they were spoken. Like anything in the news cycle it was everywhere and beaten to death for a small eternity, and then disappeared forever, until that moment. The intention was not to humor the audience. It was not for “Ships and Giggles,” as the saved digital version of his poem was titled. In the midst of cofeveve chaos, Julio considered Trump to be a poet, bringing meaning to things that otherwise lack substance. But then he thought about the implications of that. It was the only poem to remind us of what parts of our lives are not visible here. To remind us that although not all terrible things are happening to each of us individually, they are still happening to us, collectively. In human life, everything is connected in a great web of suffering and joy. Many, if not all, conveyed the idea that the journey continues everyday. It doesn’t end upon arrival, or through proper enunciation. For Richie Wills, who moved to New York from Nigeria when he was 10, that journey took on an another mile when he visited a white therapist as a black and queer patient. I didn’t ask if he continues to visit the aforementioned “white therapist.” For some reason, it didn’t seem relevant when we spoke. What I could gather was that he wasn’t looking for words of encouragement. What he needed and what he asked of us that day, like the other presenters of the day, was simply to be seen, and heard, and felt.